Class reunions can be a challenge to get through for some people. Make your next reunion a little more enjoyable you and your friends, with this survival bag. 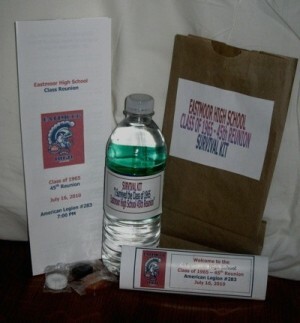 This is a guide about how to make a class reunion survival bag. Our class is having their 45th reunion this year. I took a paper lunch sack and made a sticker for the front of the bag that said: "I survived the EHS Class of '65 - 45th Reunion." I put the same sticker with information on a bottle of water, a package of Lifesavers, and a candy bar covered with a new cover regarding our reunion, and an ink pen. I stapled the bag closed at the top and attached their name tag on it. I set the bags out on the table in no particular order and when they checked in they found their survival bag and met the folks at their table then could move to another table if the wished.